I’ve finally purchased the 16 inch archtop I’ve always wanted. Kinda. Actually the guitar I’ve wanted for the longest time is a Gibson ES-175. I’ve lusted after many guitars over the years, not just the ES-175. But even while still in high school I was infatuated with this 16″ archtop. Although it’s associated with jazz guitar (many of my heroes such as Kenny Burrell, Joe Pass and others played one), I could picture myself playing rock on it back in high school. I was clearly a non-conformist even then. Steve Howe (Yes and many other groups) is known for playing an ES-175 though that had no influence on me. ‘Little Charlie’ Baty who played an ES-175 for most of the time he and Rick Estrin led the blues band “Little Charlie & the Nightcats” did inspire me. He confirmed you could play blues as well as jazz on a hollow body. This isn’t really news since much of early rock was recorded on hollow bodies. Scotty Moore backed Elvis on a Gibson ES-295 which is essentially a gold top ES-175 with P90 pickups. So I finally got an ES-175? Are you crazy? Do you know how much those cost? No, I didn’t purchase an actual Gibson ES-175. I bought an Eastman AR371CE. It differs in a number of aspects from the Gibson. It has a wider neck with a 1 3/4″ nut width. It is slightly deeper (by about 1/4″) but most importantly compared to the standard ES-175 model currently sold by Gibson – it is much lighter in weight. It is made with a lighter maple laminate than currently in use by Gibson. Many are describing the top thickness as being similar to that used by Gibson in the 1950s on the ES-175. You can currently purchase a genuine Gibson ES-175 with the thinner top by getting one of their Memphis 1959 ES-175 Historic Re-issues. That will cost you over 5X what the Eastman cost. 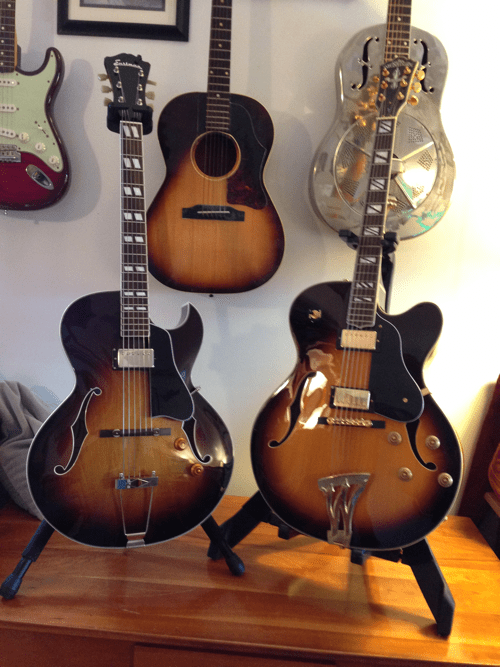 One thing I feel I need to explain is why I am selling the archtop I’ve owned for years. The image below shows my two archtops in the foreground. The new Eastman is on the left. I’ll be trying to sell the Washburn on the right on Ebay soon. The Washburn J6 is a wonderful guitar. It plays great. The pickups, though not replaced with more expensive pups as many guitarists do, sound really good to my ears. The guitar looks great, though it is obviously a urethane finish and not lacquer. The J6 is a dual pickup which should give it a slight advantage in terms of versatility. So what are the differences between these guitars and why did I choose the Eastman over the Washburn? The first and biggest reason is size. If you’ve read many of my blog articles here you know I prefer smaller sized guitars. dreadnoughts and 17″ archtops just don’t fit me. I find them uncomfortable to play for any length of time. I found the Washburn so uncomfortable that I didn’t play it anymore. This doesn’t mean you’d feel the same. The Washburn is about the same size as a Gibson L5 and plenty of guitarists are happy with that guitar or wish they owned one. It’s a personal thing. But big didn’t work for me. If I could ignore the ergonomic size issue, the Washburn was really a nice guitar. Not as nice as the Eastman. The AR371CE has been given great reviews by a number of publications (e.g., JazzTimes andPremierGuitar). Even though the Eastman has a laminated top, it still has a strong acoustic sound. The Washburn, though having a larger body, is not as loud acoustically, probably due to a thicker laminated top and heavier Urethane finish. The Eastman has a lacquer finish. Another difference is scale length. It’s not something I have paid that much attention to in the past. I’ve got guitars with 24 3/4″, 25″, 25.4″ and 25.5″ scale length. But recently I’ve begun to notice that certain licks are easier on my 24.75″ scale length guitars. The Washburn has a 25.5″ scale same as a Gibson L5. The Eastman has a 24.75″ scale length the same as a Gibson ES-175. I think I like that better. The nut width is also wider on the Eastman. I like that a lot. It’s one of the reasons I love my OM-28. My fingers enjoy having a bit more room. The pickups used by Eastman on most of their archtops used to say they were Kent Armstrong pickups. They are no longer specified so maybe they are using other pickups. Whatever it is, it looks and sounds good. One of the things I like about this guitar as well as the Gibson ES-175 is the metal parts are nickel plated, not gold. The Washburn has gold plated pickups and metal parts. Gold does not wear well. You can search forums for Gibson Les Paul or other models that have gold parts and find people complaining about the finish. It doesn’t matter who makes the guitar or the pickups, gold parts do not age well. The pickups on the Washburn are one of the few items concerning the appearance that I didn’t like. Nickel is easier to maintain. Overall, I am extremely happy with my new guitar. I’ve already played until my fingers hurt. That’s a good thing. That’s love. Based on your positive review and others I’ve read I put a deposit on a new AR371CE. As a left handed player I must relate the extortion attempts by various Eastman dealers throughout the US. Left Handed guitars are always a difficult find-this model by Eastman is no exception. I first tried my NJ dealer who was sold out, had some on order but could not provide an arrival date. A number of randomly selected dealers from the Eastman website were contacted-no stock, a six to twelve month wait and $180.00 upcharge for a left hand version were the standard reply. I currently own a dozen guitars, all left hand models and have never paid an extra charge for any of them. Never will either. My tenacity and refusal to give in to the upcharge extortion paid off-I found an LH model on the W.Coast for the same price as a righty, 30 days to pay and free shipping as well (though anyone not fresh off the turnip truck knows nothing is free!). One question-Is there any volume when played acoustically or is it minimal? Thanks for the review! How much acoustic volume is a good question but the answer isn’t straightforward. I experimented with different strings after I got the guitar. The dealer had put D’Addario Chrome 12s (12 – 52/1000ths) on the guitar. The guitar had fairly good volume with those. I later tried Rototsound RS200 Monel flatwound strings, also 12 – 52. These strings had a different feel and tone but still good acoustic volume. My current set is Thomastik-Infeld Jazz Swing Flatwound strings (JS112) in 12 – 50 gauge. The overall tension compared to the Chromes are less on a string by string basis according their published tensions. I can tell the acoustic volume is definitely less than with Chrome or Monel 12s. You can still hear the guitar acoustically but it isn’t as alive as it had been. Personally, I like the Thomastik strings both for their feel and how they sound plugged in. The lesson is if you want a louder acoustic tone, you need more tension. Not surprising. The question is do you like the feel of higher tension strings and how important is a loud acoustic tone. Many of the reviews I saw for this guitar were from jazz players who want as heavy a string as they can get. They’ll get a good loud sound from the guitar with those. Thanks for the question. Hope you enjoy the guitar. I still love mine. I see from the spec. on the Eastman website they put D’Addario EJ21 Roundwound 12’s on at the factory. What type of volume do you think these put out? Did you try these or immediately have the Chromes put on? I’ve tried Thomstik roundwounds on my Epiphone Dot-found them a bit stiff. I had a pack of Rotosound rounds I picked up on a trip to the UK-put them on my Les Paul-liked the sound they put out. The guitar had roundwounds when I first tried it. I didn’t check/ask the gauge or brand so I’ll presume they were the same as the spec’s you found at Eastman. The shop owner gave me a free set of strings of my choosing when I decided to buy and restrung the guitar while I waited. But of course the choice of brand or gauge was from within those he stocked. I thought the volume increased significantly after the change to the Chromes. I just checked overall published tension for these strings. The EJ21 are described as a light gauge set and have a total tension of about 149 lbs. The Chromes 12 set (ECG25) has a total tension of about 162 lbs. The Thomastik JS112 have a total tension of about 140 lbs. So based on this, it seems you need to have 150 lbs tension or more – and 160 lbs is even better – to drive the top for a loud acoustic sound. I don’t think round wound or flat matter – that’s a preference. But the tension does matter if you want loud. for me will be important to know if the 371 has a volume with no amp as close to the 805.,I prefer to play with no amplification.,the explication about the tension is clear,great information, I play with 12,52,.than you dan. I don’t recall trying an Eastman 805 but the Eastman website says the 805 has a solid, carved spruce top. The 371 has a laminated top. My guess is your 805 will have a stronger acoustic sound because of the solid top. I find my 371 unplugged sounds quite acceptable to me for practice. But that’s a subjective assessment and isn’t comparing it to anything else. My flat top acoustic guitars, e.g., my Martin OM-28, are much louder than the 371 – not a surprise. I have a 16 inch 805 and from an acoustic standpoint it is a little stronger than my 371 but of course it has a carved spruce top.The 371 is surprisingly good unplugged and sounds really good through an amp.For the price[or any price] these guitars are amazing.I have a 1954 175 with a single P90 and I much prefer the Eastman! I just purchased one of these for $550 from a friend. I’m completely head over heels for it. Dan, from a still-beginner: How do you compare the Eastman archtops relative to the Godins? Quality, value-for-price. Thanks. — Ron J.
I don’t know enough about Godins to compare. Godins make some nice looking instruments but my personal choice would be Eastman. Like I said, that’s not based on experience with the Godins.